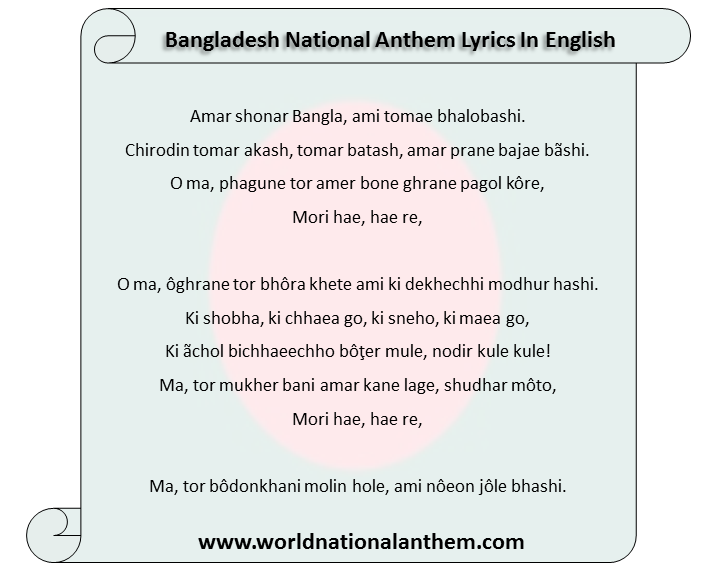 Amar shonar Bangla was written and composed by Rabindranath Tagore in 1906. the anthem was officially adopted in April, 1971. the lyricist has also written and composed the national anthem of india. Amar shonar Bangla, ami tomae bhalobashi. Chirodin tomar akash, tomar batash, amar prane bajae bãshi. O ma, ôghrane tor bhôra khete ami ki dekhechhi modhur hashi. Ki ãchol bichhaeechho bôţer mule, nodir kule kule! Ma, tor bôdonkhani molin hole, ami nôeon jôle bhashi.